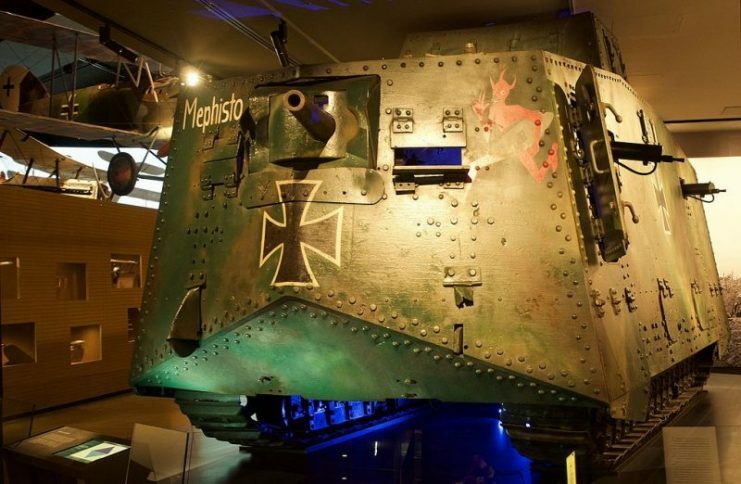 The last remaining German A7V Sturmpanzerwagen tank from World War I is going on permanent display at the Queensland Museum in November. The timing coincides with the 100th anniversary of the Armistice. Geraldine Mate is the museum’s curator. She says the tank is the only one of its kind. Surprisingly, the tank has spent 98 of its 100 years in Queensland. 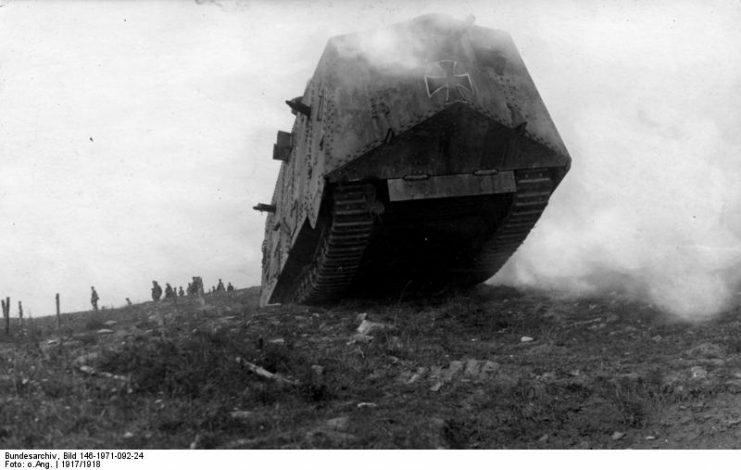 At the end of WWI, tanks were seen to be game changers. 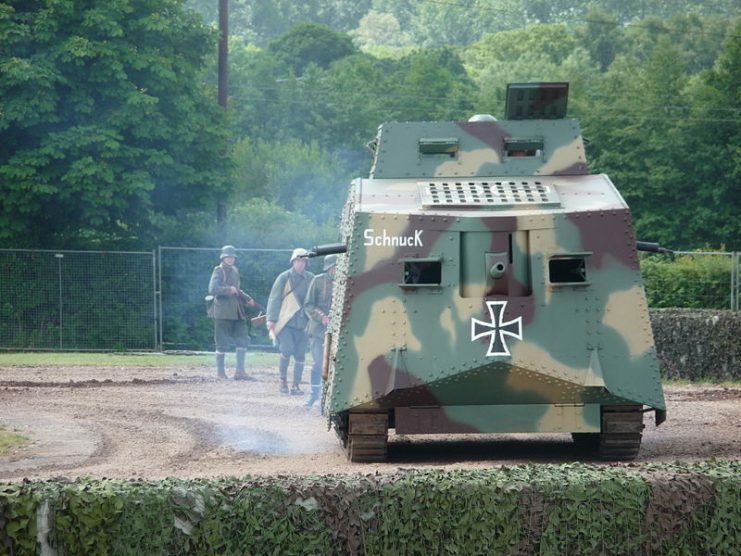 Still, Germany was only able to get 20 of the armored vehicles into the war before it ended. All twenty of the tanks were A7Vs. 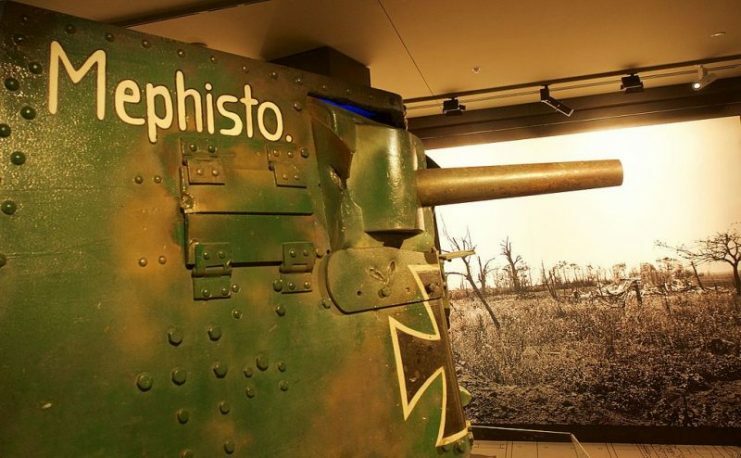 This particular tank was nicknamed Mephisto. 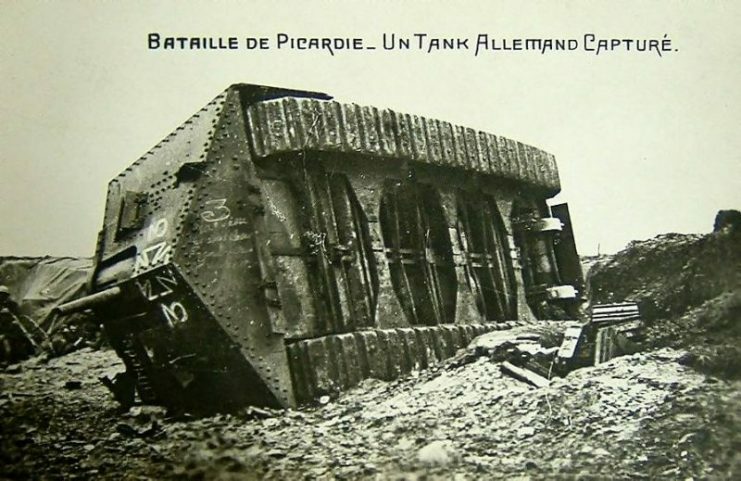 It weighs 33 tonnes and suffered the same fate many other tanks of the era experienced; the weight of the tank caused it to bog down in the mud at Villiers-Bretoneaux. The German crew abandoned the tank and Queensland soldiers in the 26th Battalion seized it. To get to the tank, the soldiers had to cross no man’s land under fire from the German small arms, machine guns, artillery, and poison gas. Once they got to the Mephisto, they hooked it to two British tanks and towed it to friendly territory where it immediately became a hit with the troops. Everyone vied to get a photo of themselves standing next to it. A book has just been published to commemorate the 100th anniversary of the Mephisto’s arrival in Brisbane. 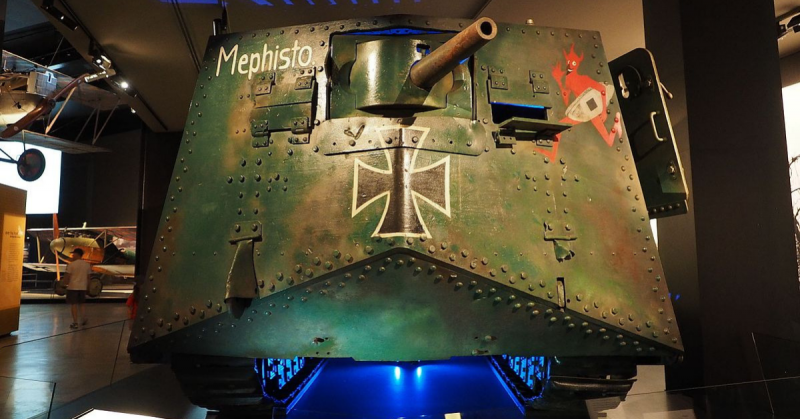 “Mephisto: Technology, War and Remembrance” tells the story of how the German tank ended up in Australia. 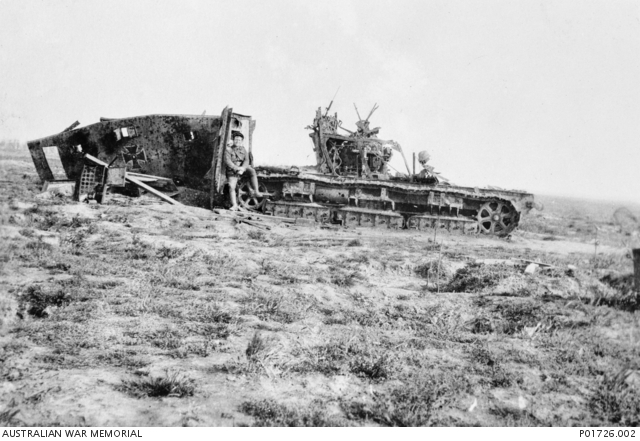 Co-author Jeff Hopkins-Weise said that, since the tank had been captured by soldiers from Queensland, it was seen as a prize for Queensland. 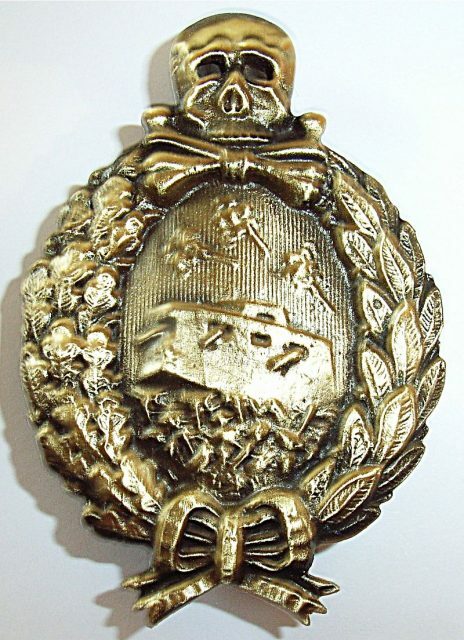 It was valuable for morale on the home front for people to see that their soldiers from their home had captured this special prize from the Germans. The Mephisto spent decades outdoors at the Old Museum in Brisbane before it was moved to the Queensland Museum on Southbank in the 1990s. During the Brisbane floods in 2011, the Mephisto was covered with mud. 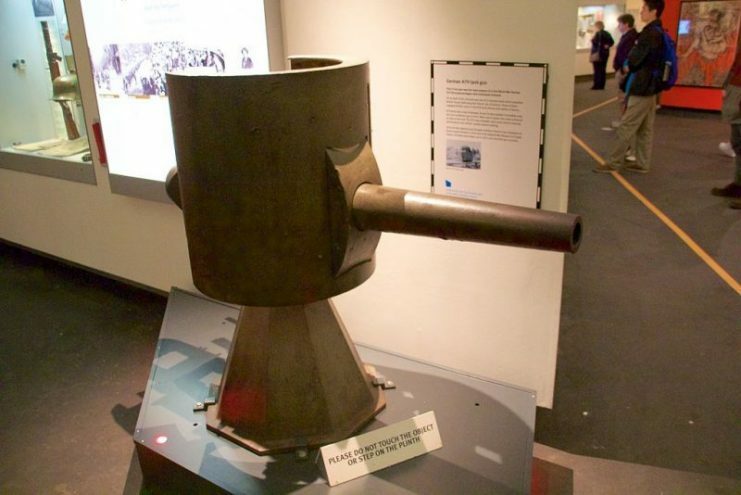 It has since been restored and has been on display at the Australian War Memorial. It is now back home at the Queensland Museum for good. 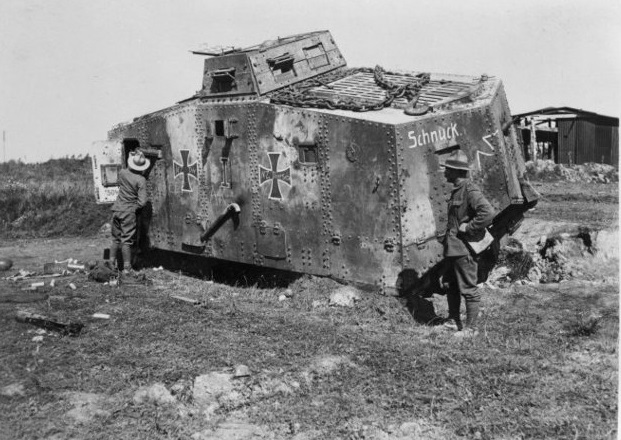 An extensively damaged A7V tank near Villers-Bretonneux. This is apparently tank 561 Nixe in which Second Lieutenant Wilhelm Biltz of Abteilung 2 fought the first tank versus tank battle on 24 April 1918. In this engagement two British female Mark IV tanks were disabled by Nixe before it was severely damaged by male Mark IV tank No. 4066. Since it is the only remaining tank of its kind, it is considered priceless. Hopkins-Weise said that, in the past, the Germans would have like to have had it back. In fact, he admitted, he’d like to have it himself, if he could. 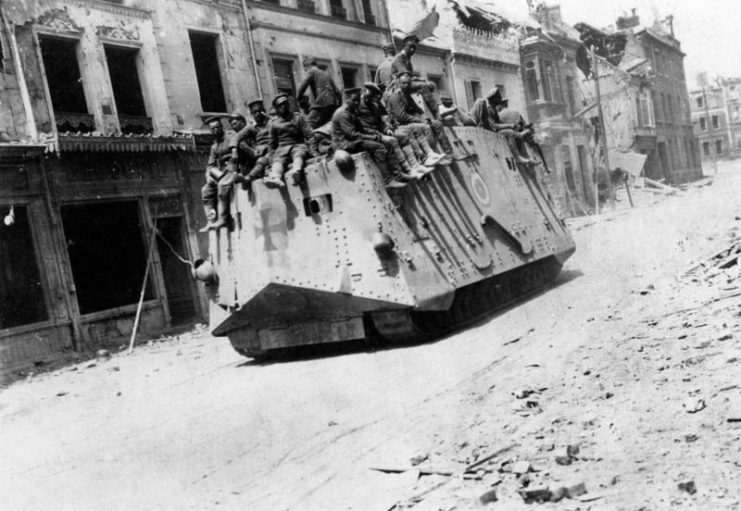 The Sturmpanzerwagen A7V was built after German leaders witnessed the psychological effect the British and French tanks had on the infantry troops. While they felt strongly that the best counter to the Allied tanks was special rifle bullets and artillery, and though they had witnessed the frequent breakdowns and difficulties tanks had crossing no man’s land, the effect a tank had on troop morale was something they could not ignore. 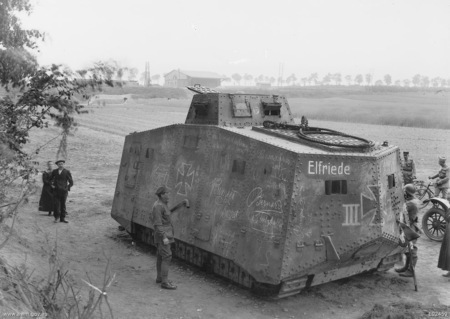 A captured German tank at Saleux, an A7V, with the name Elfriede III, used by the enemy for the first time at Villers-Bretonneux, in the attack of 24 April 1918. German command placed an order for 100 tanks, of which only 20 were ever built. 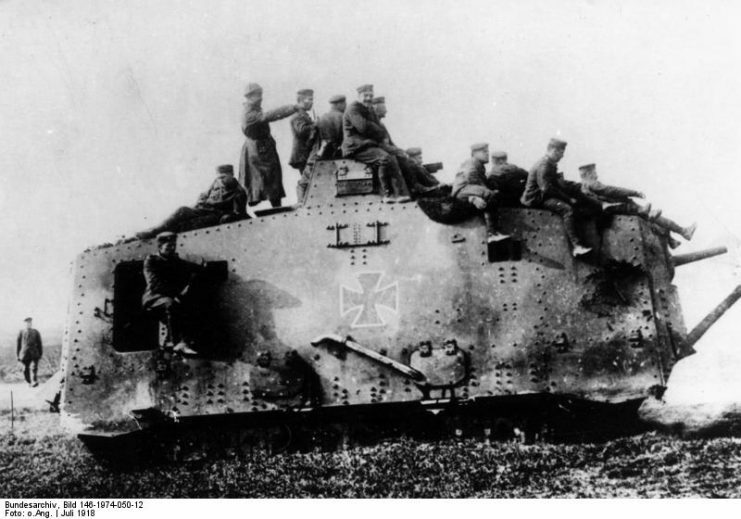 The plans for the A7V were designed by Joseph Vollmer after the Allgemeines Kriegsdepartement, 7 Abteilung, Verrkehrswesen had analyzed information on Allied tanks. Vollmer’s plans called for a top weight of 30 tons, the use of the Austrian Holt chassis, an ability to cross ditches 1.5m (4.92 ft) wide and a top speed of at least 12 km/h (7.45 m/h). The plans also included several machine guns and a rapid-fire gun. Immediately upon its introduction to the battlefield, flaws in the design appeared. The roof and floor were thin and could not block fragmentation grenades. 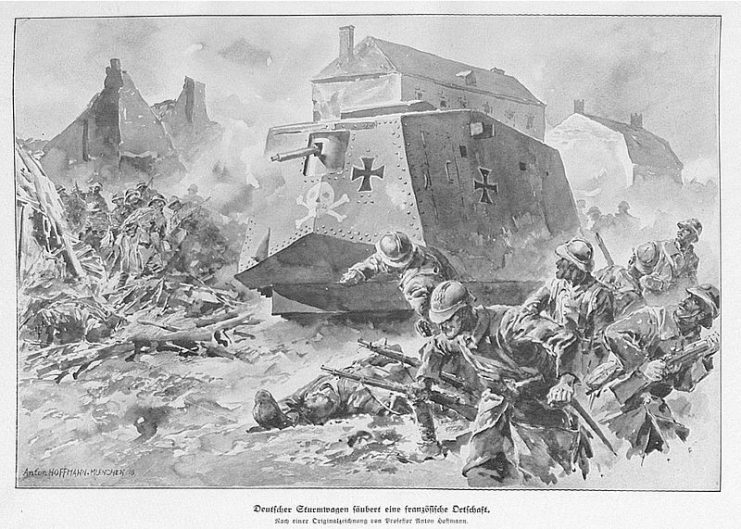 The use of regular steel instead of an armored compound (in order to facilitate production) meant that the armor was weakened and unable to resist artillery fire – similar to the weakness the Germans had already noted in the Allied designs. 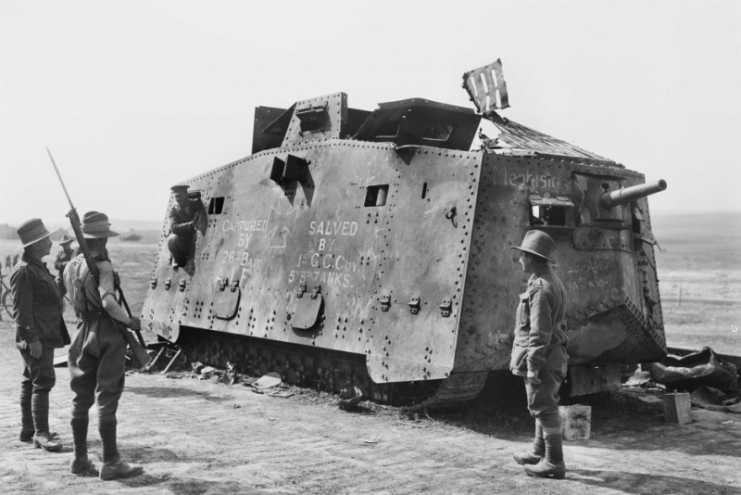 The A7V also had low ground clearance making it difficult to cross heavily cratered battlefields. The first ten A7Vs were deployed to relatively flat areas due to this limitation. After a disastrous attack in which most of the A7Vs broke down or fell into holes and were captured by the Allies, the Germans canceled the order for the remaining tanks and ruled the entire endeavor a failure.